Posted on August 10, 2012 at 12:00 pm. In developing this fantastical design for a mural in the Rosewood Neighborhood, Antwoine Thomas, with the assistance and support of Addie Boswell, began collaborating months ago with local residents through The Rosewood Initiative community meetings and activities like Youth Night to create a design that represents the positive change occurring in the neighborhood. 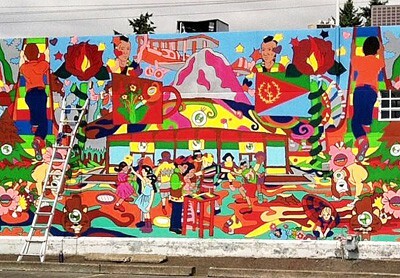 Throughout the energetic mural one can identify recognizable elements from Rosewood including roses, community gardens, diversity, and local businesses. There are also elements that link the neighborhood to the greater Portland metro area, honoring some of the neighborhoods from which many residents have relocated. While the mural contains these true elements, the design is also highly detailed and fantastical, meant to entice the senses and invite the eye to linger and keep discovering. A celebration is scheduled for Saturday, August 11th, 1:00-4:00PM. Over the last few weeks, Korean-American artist, Una Kim, has been feverishly working on a mural on the east wall of the Keller Auditorium with the assistance of students from Portland State University who enrolled in a class to specifically work on this project. The mural is located on the bottom half of the east facing wall of the Keller Auditorium along SW 2nd Street between SW Clay and SW Columbia. The design is influenced and inspired by such works as Degas’ ballerinas, Mary Cassatt’s At the Opera, and Dufy’s The Yellow Violin. Also included are a modern dancer, two musicians in an orchestra, and a jazz musician along with an acrobat to represent the large scope of the theater. Over the last several months, a mural has begun to take shape along the west side of the City’s Albina Yard Maintenance Building. Throughout the design development, community engagement has been the driving force—the Boise Neighborhood Association, community members, and the maintenance workers have all contributed their voices as to how they want themselves and their neighborhood depicted. More than a way to deter graffiti, it is a powerful, collaborative, self-reflective vision of the neighborhood created by those who live in it. The mural embraces a theme of “perpetual collaboration” through time. Community practices and industries that affected the local Portland-Albina neighborhood can be found among the local mountains, bridges, gardens, parks, icons of communities, and city workers behind the scenes that keep the city functioning. Included are symbols of the neighborhoods’ transitions of communities from the Native American, Volga German, Finn, Chinese, and African American communities. You can follow the project on https://www.facebook.com/spacecraft.missiontoarts. Work continues on this ambitious mural that extends along the north and west walls of the building that serves as the Portland headquarters for the Fraternal Order of Eagles. The mural’s theme, “The History of Hawthorne” – or the “people’s history” — celebrates this SE neighborhood, located between an extinct volcano (Mt. Tabor) and the 100 year old Hawthorne Bridge, both components of his design. Scattered throughout the mural are notable historical figures (such as Dr. Hawthorne), the asylum, pioneers, the street car line and the always changing figures that have been part of Hawthorne for 100 years. It is Haberman’s first mural grant and he is “very proud to have such a piece of art in public view and to have so much support for my crazy looking art in the city.” A celebration was held on July 1st. The west wall will be completed late summer/early fall. 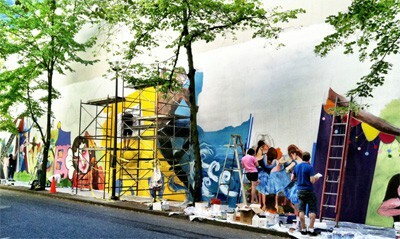 Finishing touches are underway on a pair of twin murals at NE 42nd & Alberta. Members of 42MSC began working on the project at the Alberta Court Crossing — one on the north-facing wall of the Morel Ink Building and another on the south-facing wall of Doggy Business. 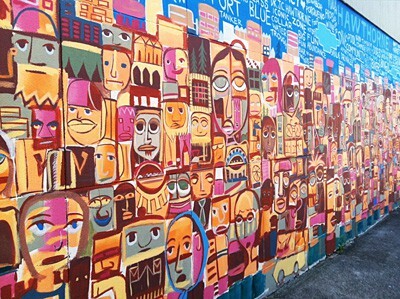 The murals aspire to invoke community through a “Tree of Life’ theme symbolizing process, change, the continuity and connectivity of life. Words submitted by members of the surrounding neighborhoods are being added to the mural and are intended to reinforce the symbiotic relationship between the commercial district and area residents. 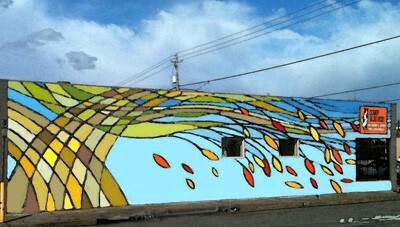 This proposed mural is situated centrally in the Woodstock Neighborhood and is highly visible from the street. 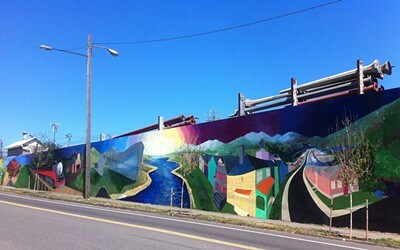 The mural aims to highlight the best of the neighborhood and instill a sense of community pride. Local artist Mike Lawrence designed a mural for the building’s west wall that celebrates commerce, education and the outdoors. The Lutz tavern wall that will host the mural is divided into three sections, as is the mural. A strong central figure grounds each section. Each figure is adorned with symbols of Greek Gods that represent the theme of each section. The project is still fundraising and hopes to begin the project next Spring. 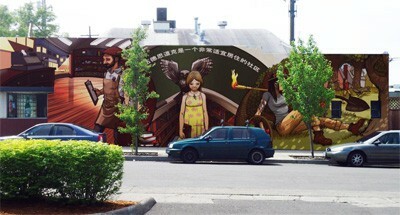 For more information and a copy of the mural program guidelines, visit www.racc.org/public-art.